Active powerful stainless steel cleaner specially formulated to clean, seal and finish shiny stainless steel and chromium surfaces - providing a long lasting protective coating. 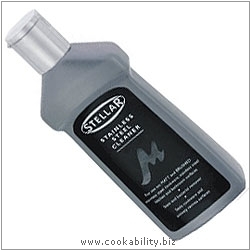 Removes stains and bacteria from stainless steel and chromium surfaces in the kitchen and bathroom. Ideal for stainless steel cookware, cutlery, dishwashers, oven surrounds, irons, cooker tops and sinks. Will bring a lasting shine to the taps and fittings in the bathroom. Packaging has been updated.